Legal Medical Abortions Are Up In Texas, But So Are DIY Pills From Mexico : Shots - Health News Women seeking an abortion in restrictive Texas now often pick the medical version, thanks to FDA rules making it easier. Others seek cheaper pills in Mexico, and aren't getting guidance from a doctor. 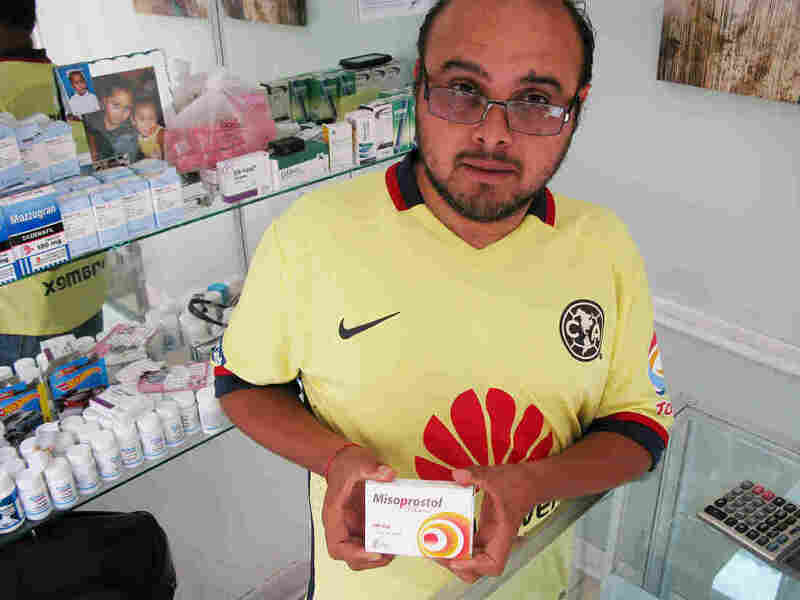 Luis Alberto de la Rosa says he sells lots of misoprostol, a drug used in abortions and in ulcer treatment, to women from Texas who come to his Miramar Pharmacy in Nuevo Progreso, Mexico. However, the recent spike in the number of women choosing legal, non-surgical abortions in U.S. clinics has not slowed brisk sales of abortion drugs south of the border, in Mexican pharmacies. One of the two medications in the regimen — misoprostol — is easy to get without a prescription in Mexico and significantly less expensive there. More and more young women from Texas are walking across the international bridge for risky, do-it-yourself medical abortions with misoprostol that lack the second drug, mifepristone, and also lack the guidance and supervision by a doctor that the women would get in the U.S. The two-drug combination, when taken in this way, has a 95 percent success rate, studies show. A 25-year-old child care worker who asks to be identified by her initials, H.D., has opted to terminate her seven-week pregnancy under a doctor's care in San Antonio. She sits in a black easy chair in a room with soothing mauve walls at a Whole Woman's Health clinic. Like more and more women who choose abortion in Texas, she's decided against surgery. "The reason that I would choose the pill versus the surgical procedure is the comfort of your home," she says, "without you having to deal with coming to the office and then being hounded outside by protesters or what have you. And a lot of times you don't want too many people knowing what's going on. With the pill I feel like it's more to-yourself." Texas is hostile territory for abortion rights. In 2013, the Republican-controlled statehouse passed the Texas Omnibus Abortion Bill, imposing sweeping new restrictions on surgical and medical abortions. The Texas law requires clinics that perform abortions to meet the same strict standards as ambulatory surgical centers, and requires doctors at the clinics to have admitting privileges at a nearby hospital. And, according to the law, all abortions — medical as well as surgical — must be done at the clinic. The Texas law, which is now before the U.S. Supreme Court, had the effect of closing more than 20 clinics that performed abortions in the state. Believing the longtime FDA rules on abortion pills were plenty strict, the Texas legislators also included in the law a requirement that doctors strictly follow the agency's guidance. The lawmakers' strategy worked. Use of the abortion drug regimen in Texas fell sharply after the law passed. But the FDA's current label on abortion medication, updated in March, now requires fewer doctor visits, meaning women can take most of the pills at home. The dosage of mifepristone is lower. And they can take the medication regimen up to 10 weeks into a pregnancy; before, it was only seven weeks. Effectively, the FDA's updated labeling gave Texas women an end-run around the state Legislature's anti-abortion posture. Staff of Whole Woman's Health, which has three Texas clinics that perform abortions, say they have seen requests for medical abortions jump from 1 in 10 patients to more than half of all patients. And Planned Parenthood has noted a fourfold increase in women seeking the abortion drug regimen at its five clinics in Texas. "Many women felt that it was a more natural feeling, a more personal experience that didn't have to be so clinical and surgical," says Rachel Bergstrom-Carlson, manager of the Planned Parenthood clinic in Austin. "They were in their home; they were in charge of their own bodies." Mifepristone was first available in Europe as RU-486 and was approved by the FDA in 2000 for use in medical abortions in the United States. Today, in the U.S., just over a third of women who get abortions in the first nine weeks use medication, according to the Guttmacher Institute, a nonprofit that studies abortion issues. And the number is climbing. Researchers say more women are asking for it, and more abortion providers are offering it. To abortion foes, both procedures are equally bad. On a recent weeknight, a group of Catholic women march around the Whole Woman's Clinic in McAllen, Texas, praying the rosary. "We're against abortion in any way. We're against the pill," says Rosita Rodriguez, wearing a red T-shirt with the words "Keep Calm and Pray On." "We're against anything that goes against the moment of conception. That's why we're praying." Meanwhile, embattled abortion rights advocates in Texas and outside groups that support them see the FDA's updated guidelines as a rare bit of good news. "This is definitely a positive step for women — the FDA label change and increased availability of medication abortion," says Janet Crepps, senior counsel at the Center for Reproductive Rights in New York. "But it's not addressing the root problem, which is all of the unnecessary regulations that are closing clinics and placing obstacles in the path of women seeking abortion." The heavy regulations on Texas clinics that provide abortions, coupled with the cost of an abortion — medical or surgical — is driving some women in South Texas to cross the Rio Grande to visit one of an estimated 200 pharmacies in the city of Nuevo Progreso, Mexico. 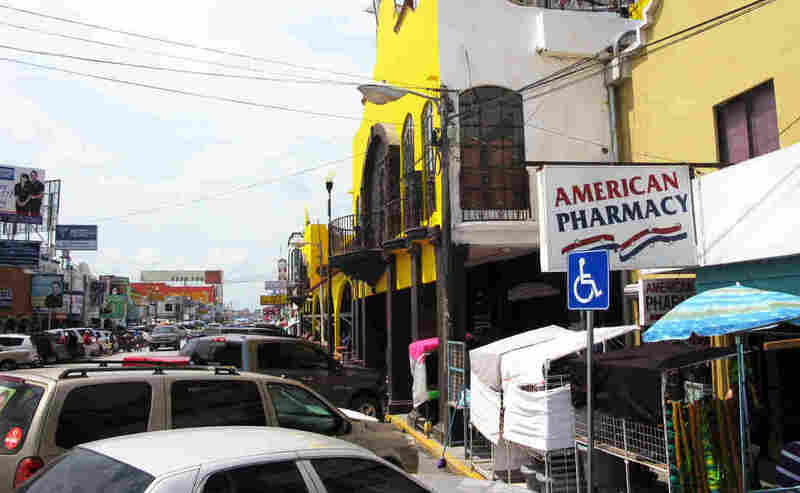 Pharmacies that line the main street of Nuevo Progreso, Mexico, sell many medicines over the counter that would require a prescription in the U.S. That's made the stores popular with visitors from nearby Texas. In the crowded, chaotic sidewalks, it's all here for the asking: dental work, eyeglasses, pirated DVDs, tequila shots, prostitutes and cheap, plentiful medicine. Drugs that are highly restricted in the U.S. — like Xanax, Ritalin, and Valium — are sold like aspirin in Nuevo Progreso pharmacies. Misoprostol is a big seller. A fleshy man with gold caps on his teeth named Roberto Gonzales says he worked as a clerk in a Nuevo Progreso pharmacy until recently. He remembers the constant stream of customers asking for misoprostol — sold here under the brand-name Cytotec. "We sold it like hot bread," he says, chuckling. "The girls in Texas came over to buy this treatment — eight to 10 tablets for a pregnancy of nine weeks. It works the fastest." Gonzales now makes a living washing cars and hustling on the streets of Matamoros. But for the eight years he worked in Nuevo Progreso, he says, he learned a few things about the drugs he sold. "They'd ask me how to use it, and I tell them what I'd heard," he continues. "Many times the instructions inside the box tell them how to do it, how to induce an abortion. I would warn them it's dangerous. Lots of times there's heavy bleeding." Gonzales' advice to customers highlights the risks of improvised, do-it-yourself abortions. Instructions inside boxes of the drug sold in Mexico actually only explain how to use it for treating gastric ulcers, and don't say anything about how to take Cytotec to abort an embryo. Because abortion is illegal in every state in Mexico, Cytotec is only sold as an ulcer medicine. That leaves customers to pick up instructions from friends, off the Internet, or from untrained pharmacy employees like Gonzales. "Now I'm looking for work in another pharmacy," he says, before walking back to his parking lot. "That's just a terrifying state of affairs — that women would turn to someone like that to give them that advice," says Crepps, upon hearing Gonzales' story. "It's the 2016 version of the back-alley abortion," she says. "And it's a very sad state of affairs." Misoprostol-only abortions — the kind offered in Mexico — are "significantly less effective" than the two-drug, combination regimen prescribed in the U.S., according to the American Congress of Obstetricians and Gynecologists. Priscilla found this out the hard way. She's a law student in Matamoros, Mexico, who says she was 18 years old when she bought some misoprostol to "bring my period back." NPR has agreed to use only her first name, to protect her privacy. "I was at home and I took the pills, then I started to hemorrhage," she says. "I felt awful. I thought the medicine was working, but it didn't." In Mexico, women have been prosecuted for going to a public hospital showing symptoms of an attempted abortion. So, Priscilla says, she found a doctor in her town who performs surgical abortions confidentially. "He took me into a room," she says, "put me to sleep, and terminated the embryo. I was so scared, so confused." Medical and surgical abortions are, of course, legal in the United States. So if there's a clinic performing abortions in the border city of McAllen, Texas, why are U.S. women going to pharmacies in Nuevo Progreso? First, it's a matter of cost. The Rio Grande Valley of Texas is one of the poorest regions in the country. A medical or surgical abortion in McAllen costs $500 compared to a pack of pills in Mexico for under $50. Second, some women may not want to put up with all the abortion regulations in Texas. They have to get an ultrasound and have the doctor describe what he sees, and they have to see the same doctor for three appointments. Finally, women in South Texas may not be aware that the McAllen clinic is still open. After the Texas Legislature passed the abortion law, the clinic was forced to close. Eleven months later, a federal judge told the center's staff they could reopen. "The point is you're pregnant and you don't want to be," says Andrea Ferrigno, corporate vice president of Whole Woman's Health. "And what are the options available to you next? The last thing you heard is that the clinic is closed and there's some sort of case before the Supreme Court about it. It's confusing." The Texas Legislature passed the anti-abortion law with the stated goal of protecting the health and safety of Texas women. Critics say it's having the opposite effect in South Texas. I asked Joe Pojman, executive director of Texas Alliance for Life and a big supporter of the state's anti-abortion law, if he was concerned that the harder it is to get an abortion in Texas, the more women will cross the border to get do-it-yourself abortions without a physician's care. "I just don't see a time when abortion is not readily available in Texas," Pojman says. "That is just not our goal. We have a goal of protecting innocent human life from conception until natural death, using peaceful, legal means and by promoting compassionate alternatives to abortion." Both sides in the abortion battle are watching the U.S. Supreme Court closely, awaiting a landmark ruling on the constitutionality of the Texas Omnibus Abortion Bill — a decision is expected this month. Abortion rights supporters say if the justices uphold the law, regardless of the FDA label changes, more clinics will close, and the Mexican pharmacies will get even more business.